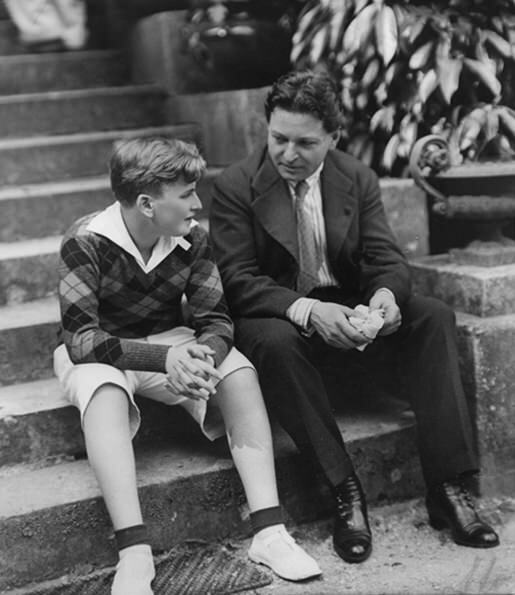 George Enescu and one of his pupils in 1931, a very young Yehudi Menuhin. The other day some friends and I were having our weekly meeting in Jomtien, where we chat over coffee and generally put the world to rights. At one point I asked them who or what came to mind when I mentioned the name Romania, the largest country in Southeastern Europe. There was a moment’s silence as we all rummaged in our memories for something tangible. Someone mentioned the notorious dictator Nicolae Ceauescu, who you may recall was the last Communist leader of Romania until he and his wife were unceremoniously finished off by firing squad on Christmas Day 1989. Someone else mentioned the Romanian composer George Enescu and the only names I could dredge up were those of the conductors Constantin Silvestri and Sergiu Celibidache. It was not an impressive display of Romanian awareness. Then we remembered the rich tradition of Romanian folk music and the Jewish Klezmer musical tradition of Eastern Europe. Folk music is the oldest form of Romanian music and is still alive and well in all parts of the country. The Romanian composer and virtuoso violinist Grigora Dinicu was greatly influenced by Romanian folk music. He is best-known for his often-played violin showpiece Hora Staccato. Jascha Heifetz once commented that Dinicu was the greatest violinist he had ever heard. Anyway, our Romanian mental adventures were inspired by the fact 1st December is Romania’s National Day, which unless you are Romanian, you may have forgotten. So it seems appropriate to celebrate with some Romanian music. Now normally, at this point I’d offer you a glass of Romanian wine, because the country is one of the world’s largest wine producers and its viticulture dates back more than six thousand years. Unfortunately I haven’t got any, so you’ll have to make do with the music. But what music it is! Many Romanian composers delved into their country’s rich folk culture as a means of inspiration. Porumbescu was no exception though we don’t hear much of this composer these days. During his short life of just under thirty years, he wrote more than 250 works and was the top name among Romanian composers, best known for his choral works and operettas. The Ballad for Violin and Orchestra was completed 1880 and became the composer’s signature work. It’s a melancholy, nostalgic piece which has that characteristic yearning Balkan sound. The work is based on the doina, a free-rhythm improvised folk style that is deeply ingrained in Romanian tradition. It’s thought that the doina originated somewhere in the Middle East. This is an excellent arrangement of the work by Thierry Huillet and the Romanian violinist Clara Cernat gives a superb performance. Enescu, the most well-known of all the Romanian composers was a child prodigy and began composing seriously at an early age. His earliest work of significant length was entitled Romanian Land and charmingly inscribed “opus for piano and violin by George Enescu, Romanian composer, aged five years and a quarter”. He studied violin, piano and composition at the Vienna Music Conservatoire and graduated before he was thirteen. In adult life, he wrote five symphonies and several other orchestral works, but he was also a sought-after violin teacher. Among his pupils were Christian Ferras, Arthur Grumiaux and Yehudi Menuhin. The two Romanian Rhapsodies are George Enescu’s best-known compositions and have long held a permanent place in the repertory of every major orchestra. The first one is by far the best known and like all his work, makes considerable use of Romanian folk music. It opens with spontaneous-sounding woodwind solos and has the feeling of shifting between major and minor tonalities, one of the characteristics of Romanian folk music. The pace soon gets going with a jolly polka leading into a haunting waltz, scored with remarkable skill. Enescu modestly claimed that the Rhapsody was “just a few tunes thrown together without thinking about it” but the brilliant orchestration and infectious energy in the music reveals that the whole work was carefully planned. There are echoes of Dinicu’s Hora Staccato at 05.56 (which was written three years after the Rhapsody was first performed) when a thrilling whirling dance emerges. There’s some stunningly good woodwind playing too. This video was recorded over twenty years ago; a superb performance from one of the world’s top orchestras under the brilliant Latvian conductor Mariss Jansons. If you need an introduction to Romanian classical music, you can hardly do better than hear this splendid ebullient work. Incidentally, the Rhapsody was completed on 14 August 1901. Its composer George Enescu was nineteen years old.